Photo: This week our teachers are preparing their classrooms on three campuses for the return of students from summer break. We are happy to report that the new Ugandan school semester for both our primary and high school students begins on September 7th. After a month-long holiday break, our teachers and students are eager to return to the empowering pursuit of education. We have 214 students (ages 5-11) enrolled in our rural primary school this year — they will be learning math, English, science, social studies, reading, writing, and the art of handcraft. We have 167 students (ages 12-18) enrolled in our high school — they will be learning English, math, geography, history, agriculture, physics, chemistry, fine art, biology, politics, commerce, and entrepreneurship. We also have 100 students enrolled in our Kampala Children’s Hope Center education program — in its humble facility the center offers a Kindergarten through 7th primary education for the children who would otherwise have no access to education. The children are studying a complete curriculum with subjects such as science, math, reading, social studies, and English taught by qualified, salaried teachers. In other good news, our high school students took part in a soccer competition during the holiday break. There were 7 different teams from local community villages, and our students won, receiving a goat as a reward. The students are so happy to have done well in the competition, and they are very thankful for the goat — its milk is a nutritious addition to their diet, and the milk can also be sold for profit in the local market. Our native-led team continues their hard work on our organic farmland to diversify the types of crops we grow. In addition to our original crop of potatoes, we now also grow beans, corn, kale, eggplant, sweet potatoes, onions, tomatoes, and pumpkins. This abundance ensures our farm staff’s employment, and helps to put a fresh-cooked nutritious lunch on our students’ plates every school day. In addition, safe drinking water from our well prevents numerous illnesses. 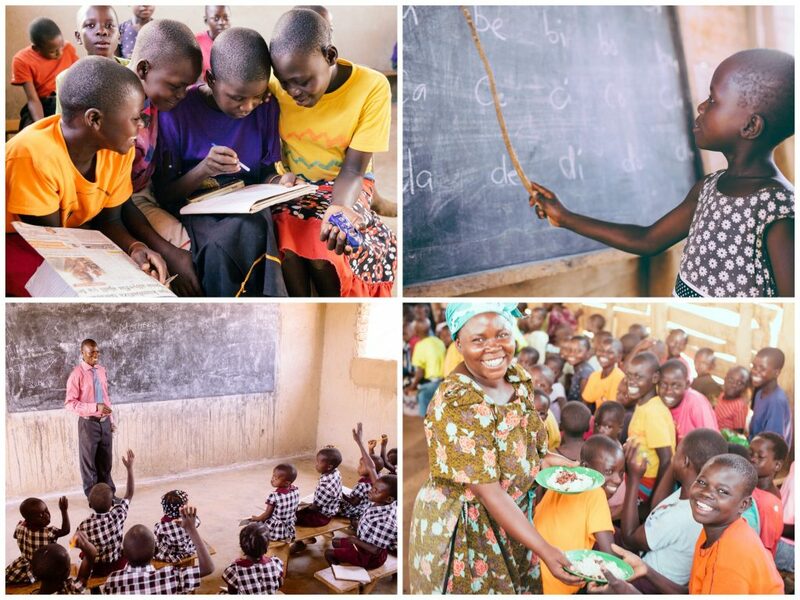 Photo inset: (Top-left) Students at our primary school enjoy studying together. (Top-right): A student at our primary school practices the alphabet during class. (Bottom-left): One of our hard-working teachers leads a young class of primary students in their brand new uniforms. (Bottom-right): The students at our school in rural Uganda are very thankful to receive a warm breakfast and a fresh-cooked lunch each school day. We also raise chickens, turkeys, pigs, and cows, so we are able to provide the children with important vitamins and nutrients, and protein and fiber, to give them energy and strength. One of our pigs gave birth to 9 piglets last week, which is great news. We raise a breed of pigs called Landrace pigs. Their sows produce large litters of piglets with very good average daily gain and high lean meat content ideal for pork production which adds protein to the children’s diets. However, we continue to have security concerns on the high school campus — the girls are vulnerable to outsiders who could lure them away from campus and harm them. Our security team cannot keep an eye on every corner of the campus at night and sometimes we do find trespassers on our property. In fact, we have experienced a recent theft from our farmland when 7 young turkeys were stolen. With your support and contributions from our generous donors, we need to raise $20,000 to fence the entire campus so that we can protect the orphan girls and our other students from those who wish to take advantage of them. We also need to raise $4,170 to protect our valuable piggery and turkey projects on our farmland enterprise. We look forward to reporting back about our progress in the building of the security fence around the high school campus and the improvements to the security of our farmland enterprise as well. We are thankful for your generous support which makes these improvements possible, blessing the lives of our students.